Every year, there are grilling accessories the Accidental Locavore just shakes her head at. Seriously now, how many of my readers grill enough jalapenos to warrant a jalapeno holder for the grill? And where is there room for all this stuff? True confession time: I hate most single-use kitchen stuff. I mean, how hard is it to peel an avocado and slice it? And if it is that difficult, just pull out a big spoon, scoop out the avocado and slice it. But back to the grilling silliness. Recently, in a trip through Sur la Table (where I was tasked with picking out my birthday present – fun! 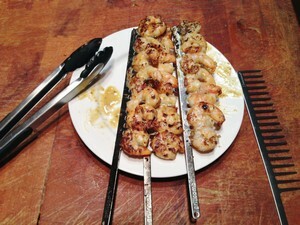 ), I noticed these large stainless combs which were supposed to take the place of skewers. It was an interesting idea, but since I don’t do that much with skewers (except use them to dry pasta, but that’s another post), they didn’t seem necessary. 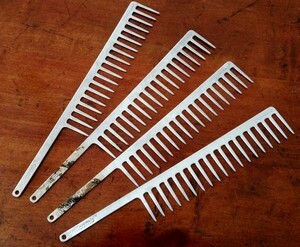 When the box arrived with my gift, my friends had thoughtfully included the combs. The other night I decided to take them out for a test drive. I was just grilling some shrimp to put on leftover risotto. It took a minute or two to figure out the best way to do that with (and food takes up a lot of real estate on these things), then I gave them a quick baste with some Caesar dressing and tossed them on the grill. Miraculously, the line about not turning them without tongs or a pot-holder caught my eye, or there might have been trouble with burnt fingers from hot metal handles. The shrimp came out fine and I tossed the combs into the dishwasher – and there’s the problem. 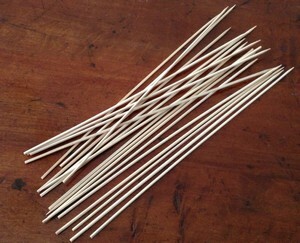 With wooden or bamboo skewers, you just throw them away. 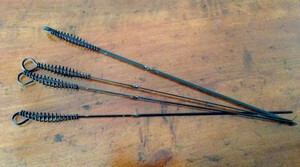 With my “fancy” metal skewers, they’re flat and they’re coated, making them somewhat non-stick, so they’re usually pretty easy to clean (and since they’re long, you don’t need so many of them). With the combs, the dishwasher did a lousy job so I scrubbed them afterwards, but something has totally adhered to the handles. Now, it’s just the handle, but it’s unsightly and impossible to remove. It did make me realize that sometimes there’s just no need to re-invent something that’s worked just fine for centuries. What do you think? A long time ago, the Accidental Locavore and friends used to go down to Costa Careyes, in Mexico. It’ s a beautiful spot, a few hours drive south from Puerta Vallarta, and at that point in time, undiscovered and unspoiled. One of the things I have always liked about the Mexican coastline, is the number of small seaside shacks, serving amazing seafood. This shrimp dish is my attempt to duplicate the incredible shrimp served at La Vieuda a tiny place just outside Careyes. A pound of shrimp will feed 3. In a large saucepan melt the butter over medium high heat. Add the shrimp, and cook until just pink, about 3 minutes. If you’re going to use asparagus (see below), add them to the shrimp now. Toss with a few generous squirts of your favorite hot sauce and the juice of a lime, until well coated. Serve over rice, garnish with the chopped cilantro and enjoy. My verdict: This is one of my go-to recipes. It’s quick to make and tastes great! If I’m feeling energetic, I’ll make green rice to go with it, or toss some asparagus (sliced into 1 ½” lengths and steamed in the microwave for about 2-3 minutes) as a veg. You could even get fancy and sprinkle some queso fresco over the top. Preheat the oven to 400 degrees. While the oven is heating, heat the oil in a sauté pan over medium heat. Add the onions and garlic and cook until just soft, not browned, about 1 minute. Stir in the tomatoes and their juice, the brandy, dill and pepper. Cook for about 10 minutes, until the tomatoes have started to meld into the sauce. Remove the pan from the heat and stir in the shrimp. Put in a gratin pan or shallow casserole (I used two small gratin pans) and top with the feta. Bake (uncovered) for about 6 minutes until the feta has just started to turn golden on the corners (it doesn’t melt, but will soften). Sprinkle some of the dill on top for garnish, serve and enjoy. My verdict: 3.5 out of 5. I used a can of fire-roasted tomatoes with chiles. The chiles didn’t add anything and while not terribly spicy, it was enough heat to be noticeable (and not welcome). If I were cooking this for more people and/or wanted to stretch it, it would be tempting to braise a little fennel and add that plus some Greek olives and serve it over orzo. 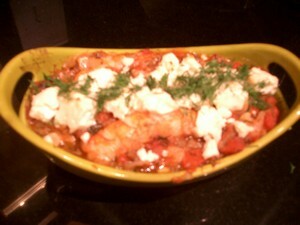 The shrimp were lovely and tender, and went nicely with the creaminess of the feta. I didn’t get much taste from the dill, it might just have traveled too far. A long time ago, the Accidental Locavore and friends used to go down to Costa Careyes, in Mexico. It’ s a beautiful spot, a couple hours drive south of Puerta Vallarta, and at that point in time, undiscovered and unspoiled. One of the things I have always liked about the Mexican coastline, is the number of small seaside shacks, serving amazing seafood. This shrimp dish is my attempt to duplicate the incredible shrimp served at La Vieuda a tiny place just outside Careyes. Since it’s almost asparagus season, I added some to liven up the plate, but you can just do straight shrimp, and serve over rice. Optional: 1 pound of asparagus, cut into 1 1/2″ lengths, and partially cooked (I microwave them for 3 minutes). 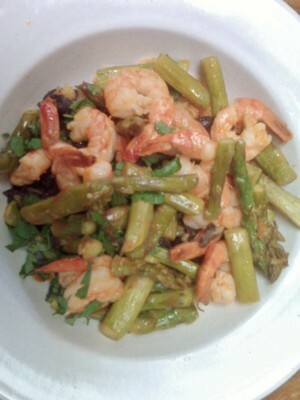 A pound of medium shrimp will feed about 3 people, more if you add the asparagus. In a large saucepan melt the butter over medium high heat. Add the shrimp, and cook until just pink, about 3 minutes. 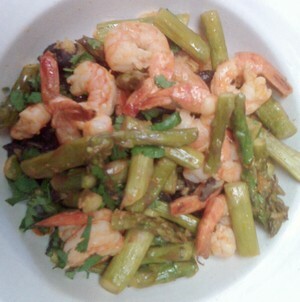 If you’re going to use asparagus, add them to the shrimp now. Toss with a few generous squirts of your favorite hot sauce, (I use Frank’s Red Hot Original) and the juice of a lime, until well coated. Serve over rice, and garnish with the chopped cilantro.